Midori® Melon Liqueur’s quality and delicious taste come from the blending of the juices of premium muskmelons — which are extremely rare in Japan. Grown in only one region of Japan, they are incredibly hard to find. Because of this, they can sell for as much as US $20,000 in their first harvest. In addition to their rarity, both musk melons are cultivated in rich soils to create the tastiest melons. By extracting the essence from two different Japanese melons using two different production methods, a premium melon flavor is born. 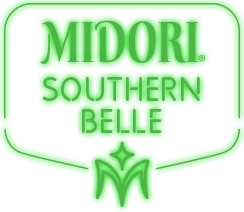 MIDORI® is Japanese for green. The emerald green found in Japanese nature is where MIDORI® was born. MIDORI® is the original melon liqueur enhanced by premium Japanese muskmelons that can be enjoyed with juices, spirits and other liqueurs – a fruity sensation of fresh melons. The flavor of Midori is that of a very sweet melon. I would not peg it to a specific type of melon, but more of a mix. This is only right because Midori is made from two types of melon. Yubari King Melon: Often touted as the most expensive fruit, yubari melons are a cross between two cantaloupes and are grown near Yubari City in Japan. It has a juicy sweetness and orange flesh. Musk Melon: The musk melons used to make Midori are grown in the Aichi and Shizuoka provinces of Japan. Another high-quality melon, this is a juicy fruit with an amazing sweetness. It has a green flesh which inspired the green color of Midori. Build into a tall glass, add ice and stir well.&nbsp;Top with ginger beer and garnish with mint.